In June 2014, weighing in at 282kg, 29 year old AJ had a harrowing experience when he went with his grandmother to visit friends of hers.They arrived to a horrific crime scene where tragically the husband had been murdered and his wife left badly injured. It was in the midst of this experience of tragic loss of life that AJ made the decision to change his own life. Amazingly and somewhat surprisingly AJ had managed to gain his weight without suffering from any serious medical conditions other than high blood pressure, and after deciding to do something about his weight and lifestyle he went off to his local GP without telling anyone, to ask for advice. It was his local GP in Hartswater that suggested he adopt a Banting diet. This says AJ, was the best advice he’s ever received from anyone. AJ switched from eating everything in excess and constantly being hungry to following a strict Banting Diet consisting of only green listed items to start losing the weight. Within a few months with the weight dropping off he was able to start walking 7.5km in the morning as exercise, something which he hadn’t ever been able to do before. 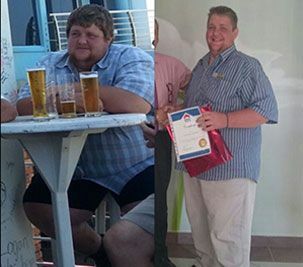 Now 15 months in, AJ has lost aremarkable 106kgs. “My whole life has changed significantly, there is not one part that I can say has not changed, I feel good, I have energy, I can exercise… Basically I can do life” says AJ of what Banting has done for him.